Leasing or buy, live a different experience of wine tasting with DIGBY. Digby, an investment to grow revenue. The Digby by the glass dispenser is a cost-effective work instrument. With an offer less than 200€ per month for a dispenser of 4 bottles, the machine becomes profitable from the first month. Only 2 glasses per day are enough to generate a profit. You can now consistently offer quality wine because it can be kept 3 weeks without altering its organoleptic properties. Take the opportunity to expand your wine menu. The risk is totally controlled! A leasing-sale option is offered for 3, 4 or 5 years with all our dispensers, including a guarantee and the maintenance during this period. Find out the features and performances of your DIGBY! For all types of bottle, including magnums. Protection of the wine by introducing neutral gas. Special glass filtering UV light for maximum protection. Maintenance screens are easy and user-friendly. You can broadcast images and videos of your choice. The connected features allow a full remote control. The assembly of your dispenser is done by modules of 2 bottles. 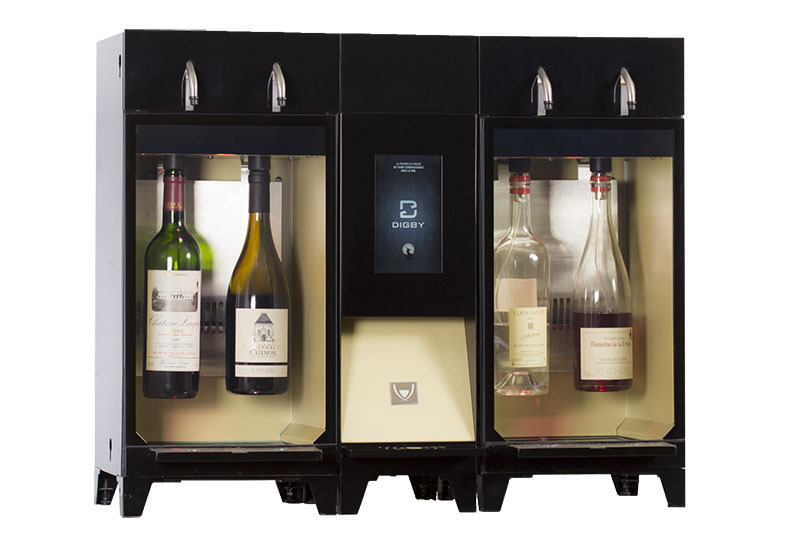 Up to 12 bottles of wine by machine. The temperature is adjustable by module. Precise and settable pouring volumes. RFID card reader included in all products. Use preloaded or debit cards. USB RFID reader with Digby software to easily loads the cards. The access to your wines is secured. Compatible with hotel room cards and club cards. The dispenser can be encased or simply placed on a table. Easy and Plug&Play to add a new module: no need to change the existing installation. One simple electrical outlet is needed. DIGBY is introducing its new piece of furniture! Total access of your machines. Enter all the wine details from your computer.